I definitely wouldn't describe myself as trendy or even someone who notices trends. However, I do love a good floral print and I have been noticing floral prints everywhere lately. I even did a quick little online search here, here, here, here, and here and found that this does indeed seem to be a current trend and one I was happy to follow. 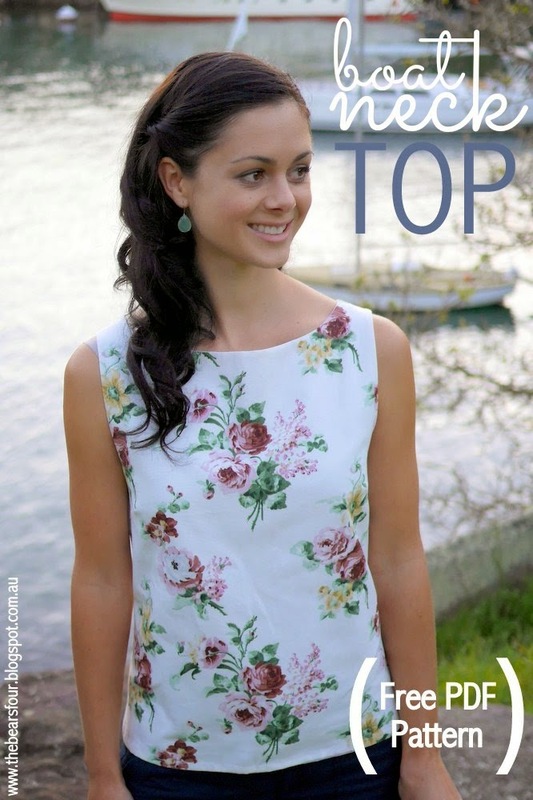 Now as much as I love some of those pretty floral tops that are out there, I CANNOT spend over $100 for one! Lucky for me, I happened upon this really sweet Ikea fabric and the best part was it's only $8 per metre. Score! So every floral lover can hop on the trend band wagon with me, I've provided a free downloadable PDF pattern that I created. Perfect timing too with today being the first day of spring. Click below for the pattern and step by step tutorial. So first things first, download the pattern here. The pattern size is an AU 12 and would probably best fit a small bust. The width can be taken in or added to to change the size. Step 1: Cut out your pattern pieces. Then place the pattern pieces onto your fabric, pin and cut out. You'll need to cut 1 front piece out of your floral print and the lining fabric, 2 back pieces (make sure to cut a left and right) of main floral fabric, 2 back pieces out of the lining fabric. Make sure to mark the angle of your darts on the wrong side of the fabric for both the main and lining fabric. Step 2: On the wrong side of the fabric, bring the dart lines together, pin and then sew. The right side of the fabric should look like this, once you have sewn the darts. Step 4: With right sides together, pin and machine stitch the main fabric back pieces to the front pieces at the shoulders. Press the seams open, then repeat the same process with the lining fabric. Step 5: With right sides together, pin and machine sew the lining fabric to the main fabric around the neck and arm holes. Make sure to align the shoulder seams. Excuse the lighting. I had to finish this up at night once the bears were asleep which makes for poor lighting. Next trim the seam allowance down to 5mm and cut out triangles to allow for smoother curves. Turn right side out and press the seams so everything lies flats. Step 6: With right sides together, pin and machine sew the lining side seams together. Repeat with the main fabric side seams, and now you will have arm holes. Press the seams open so they lie flat. Step 7: Along the bottom edge of the main fabric, press under 1 cm, then another 1 cm to the wrong side. Pin and sew to create the hem. Press. Repeat with the lining fabric but increase to 1.5 cm when creating the hem. Pin and sew. Press. Step 8: With lining fabric and main fabric together, turn over each centre back piece 1 cm then 2 cm, press, pin and sew along the the folded edge. Step 9: Mark the positions of the 5 buttonholes, spacing them evenly apart. Using your buttonhole foot, sew the buttonholes onto one side and the buttons onto the other side. Press. This is beautiful and simple. Love it! Superb ! Well made tutorial, simple to read and to follow instructions ! Can't wait to make such a top with one of my fabrics. Glad you found it easy to read and follow. Good luck on making your top! Thank you for the pattern. I have some spotted cotton and this is just perfect. Also love the little SuperHero cape which I have promised my grandson! Oh this top would look great in a spotted cotton. The superhero cape is a real winner. My kids still play with theirs even two years after I first made them. Good luck with your sewing projects. Thank you Lucy-Anne, I hope the top turned out like you wanted. What a nice top. Love your pattern and tutorial. I have just the right fabric at home. Thank you! Thanks Lydia! Hope your top turns out lovely. Hi Carla, the seam allowance is 1/4 inch or 0.64 cm. Is the seam allowance included in the pattern pieces, or should we add it ourselves? Thanks! Hi - thanks for this pattern - it's lovely and very simple to follow. I found some old vintage fabric that belonged to my mother and made it in that - looks great! I just stumbled on your pattern - thanks for making it available. I will try it as you designed it, but wondered if you could modify it by applying a bias tape to the armholes and neckline and eliminating the lining? The lining could add unwanted weight to some summer fabrics. You could definitely use bias tape instead of lining it. I only lined it because I don't have a overlocker and don't like the look of unfinished seems. Sorry, another question as I work on taping the pattern pieces together. Was this intended to be printed on 8 1/2" x 11" paper as is standard in the US? The 1" x 1" test square measured fine, but I am missing a portion of the right-hand sides of pattern pieces #3-7. And page #8 is done in two pieces because it's too wide for the paper, right? Thanks. The pattern was made using Australian size A4 paper, so 8.3 x 11.7, you might have to set your printer margins as long as you can to get it all printed on one page. Not totally sure if it will all print though on American size paper. Hi there! Is this pattern still available? I clicked the dropbox link and it lead to nowhere :( Great make! Simple and effective. may you please sent it to me? Hi! Saw this on Pinterest and saved it- am looking to make a top for my daughter's homecoming outfit. We've made a skirt and it's out of a gold brocade fabric. We've picked the fabric is a lace that has the same color gold tone in it. Do you think this patter would work okay with lace? I love the design. Thanks for your input! I'm really not sure I would use this pattern with lace, unless you used a zipper instead of buttons. Good luck with the homecoming outfit! I adore it!!! muy bonito..greetings from Peru!! Thank you for the tutorial. I make shell tops but with only facings on the arm and neck edges. I really like the finish that the full lining gives. I can't wait to sew using this method. I cant download it. Could you email it? Cute top, but, it would not work for someone that lives alone; how would you ever be able to get into it??? For me this blog is great. It is very great that people can get to know about such information. It really makes the pattern stand out. I cannot download it. Could you email it to me? It semes the link does not work. The link is no longer working, could you please email it to me please?